“Coming to America” is a common refrain from light aircraft producers in some countries. Why? The obvious reason is that most designers perceive a huge market in the USA. Another is that shipping from the USA to other countries proves easier than shipping from their home countries. Other reasons also exist but those two are enough to decide in favor of the move. 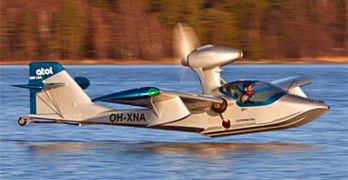 One builder of a LSA seaplane is Atol Avion, based in Finland. They have been moving steadily toward approval, production, and sale of their Atol amphibian. We have received new investment to support our European certification, which is expected by the end of 2017. We have established our North American operation in Brunswick, Maine. We have received our first order from Australia …so all is good and very positive. 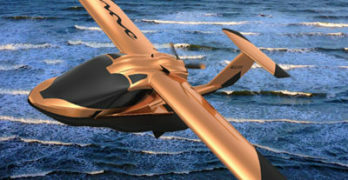 Icon Aircraft CEO Kirk Hawkins shared a computer depiction of events leading to the crash of an A5 flown by factory chief pilot, Jon Karkow. From A5’s onboard black box Icon engineers assembled a second-by-second path for the ill-fated Light-Sport Aircraft. The data showed speed, power settings, flap position, and more. NTSB wrote, “The pilot, Jon Karkow, of Icon Aircraft in Vacaville, was flying too low, and mistakenly entered a canyon surrounded by steep rising terrain.” The investigative agency said Karkow had taken off from the Nut Tree airport in Vacaville at 8:50 a.m. accompanied by passenger, Cargi Sever, a new Icon employee. The pilot intended to take Sever on a familiarization flight in the Icon A5 amphibious Light-Sport Aircraft, said NTSB. Now that we are in the middle of winter, activity is brisk. Middle of winter!? Down under in New Zealand, residents are presently in the colder months of the year. Pilots in U.S. states currently sweating through summer may need a moment to ponder that. New Zealand may be a long ways away but the Vickers Aircraft team building Wave are bringing their fascinating aircraft ever closer. As they work, they are gaining experience with new equipment used to build Wave LSA seaplanes. “Our tooling is all in place now,” said CEO Paul Vickers. “Initial parts are coming out of molds and they are matching the CAD files perfectly.” Modern design, even of more affordable aircraft, are often fully created on computer work stations. The days of hand making a prototype are passed and the older way is nearly extinct. “We’ve also recently doubled the size of our facilities,” added Paul. When summer rolls around and the sweat rolls off, it’s a perfect time to think about float flying. In the Light-Sport Aircraft or light kit-built airplane space, you are lucky to have a broad number of choices. This includes seaplanes (with boat hulls), floatplanes (land planes equipped with floats) or either of those on aircraft such as weight-shift trikes. 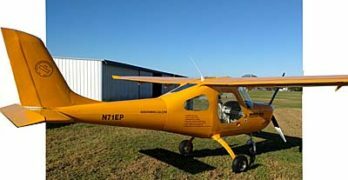 Legend Cub is a modernized version of the old Piper Cub. Sulphur Springs, Texas-based Legend was an early entrant to the LSA world. They’ve done well enough under the leadership of Darin Hart to occupy the #5 spot on our all-time-fleet ranking of Special LSA; they are one of only five LSA producers with more than 200 aircraft registered with FAA. 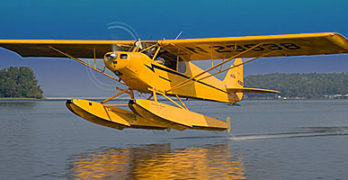 American Legend flew a float-equipped Legend Cub way back on March 11, 2005 even before the first Special LSA were accepted by FAA. Legend’s floatplane offering boasts advantages. “It weighs less than comparable aircraft, cost less, and came with the added advantage of doors and windows on both sides of the cockpit,” observed the company. SeaMax from Brazil has been somewhat absent in recent years. I will spare you the detail but the company used a lot of energy to repel an undesired takeover. In recent months that was resolved and the company is now ready to move forward smartly. SeaMax was an early LSA to meet the consensus standards as required by FAA. The first was the Mermaid in February 2006. Second was the Colyaer Freedom on January 2007. On Christmas Day 2007, SeaMax became the third. However, of those three only SeaMax has remained in regular production for the last ten years. 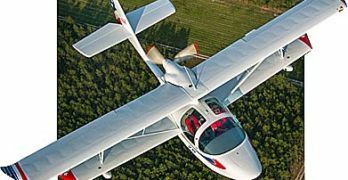 More recently, SeaMax was followed by SeaRey, Super Petrel, and A5 as ASTM-compliant LSA seaplanes. See our SLSA List for all aircraft shown in sortable columns. At Sun ‘n Fun 2017, I did a video interview with designer Miguel Rosario that you can watch below. A Powerful Wave Is Headed Your Way! Unless you’ve had your mind on other pursuits — oh, for example, preparing to head to Sun ‘n Fun 2016 next week (the show runs April 5-10) — you could hardly miss the growing buzz surrounding Icon. A soft whistle of air escaping the cabin turned into a deafening roar as Aero-News.Net (always fast with news), AOPA online, AVweb and others piled on to a story about Icon’s 40-page A5 purchase contract. Credible journalistic work was done by Jim Campbell, Jim Moore, and Paul Bertorelli (respectively of each of the publications mentioned above) in documenting the behemoth contract. I have an opinion too — one part respectful of the California company’s wish to protect their brand and their investment and and one part saying, “What the…?” I see no reason to delve into further than the lengthy stories my fellow writers already posted. Instead, I like following what’s new in Light-Sport Aircraft, light kit aircraft, and ultralights. Older readers may remember, “The Russians are Coming,” a silly movie about a supposed Russian invasion from 1966. It was a comedy set during the Cold War. Here in the new millennia a different sort of aviation invasion appears to be happening. This time it’s the Brazilians and they are not so much invading as looking for a better place to set up shop. A decade ago, Brazil was riding high, one of the so-called BRIC countries on the rise as new economic powerhouses. Flush with commodities revenue the government was free to dole out public money very generously and things were looking good. Here in 2016, that situation has changed dramatically. The economy is sluggish, President Dilma Rousseff has been earning approval ratings in single digits, and doing business in Brazil is said to have increasing challenges. Maybe that’s why Brazilian aviation giant Embraer started making bizjets in Melbourne, Florida … or maybe this country is where many of their fancy Phenom jets sell. One of the fast paced developments I’ve observed has been Aeromarine LSA’s new Merlin PSA. 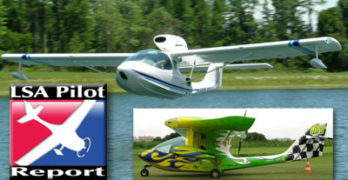 “PSA” stands for Personal Sport Aircraft and the Florida company may be truly onto something interesting. While recognizing they are very capable airplanes, many lament the cost of carbon fiber speedsters with glass cockpits and autopilots. 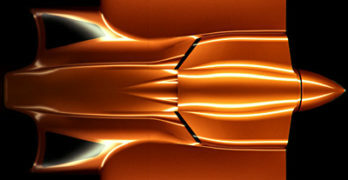 Aeromarine LSA perceives an opening. A longtime entrepreneur in the light aircraft manufacturing game, Chip sees a way to attract buyers with a very modestly priced aircraft that is fully enclosed, made with all metal construction and with interesting powerplant choices. The first U.S. Merlin PSA is powered with the 65 horsepower Rotax 582 that provide outstanding performance for such a light aircraft. SEBRING 2016 PREVIEW — Why do pilots and friends flock to Sebring? Several good reasons come to mind: • Weather is flying-friendlier than in America’s snow belt; • More than 130 exhibitors include dozens and dozens of the most popular and successful Light-Sport Aircraft, light kit aircraft, and ultralights; • Many educational forums are presented; • Hear speakers and panels; • Excellent demo flight possibilities; and, • for those in the business of serving LSA and light kits, the LAMA Dinner on opening night promises to be interesting with a “Great Debate” of engine manufacturers. 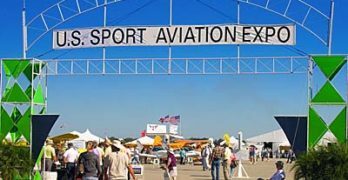 Sebring Expo is also the place where new aircraft appear, trying to get a jump on the aviation calendar with new offerings. In this article, we bring one of these to your attention. I’ve written about Chip Erwin’s newest development before (here and here). At Sebring 2016, you will finally get to see an example so fresh the paint is barely dry … yet you will hardly miss its attention-getting color. SEBRING 2016 PREVIEW — Folks are headed to Sebring. I’m already here, residing about three hours north in Daytona Beach, and it is sunny and pleasant outside. To a Floridian, it seems a bit cool … meaning mid-50s. Now, I know it’s become quite cold up north, so 50s may not sound bad; we’re softies down here. Opening day Wednesday looks improved with forecasts saying a high of 63 degrees and winds out of the north at 5-10 mph. Thursday looks even warmer with a high of 71 and winds south-southeast at 5-10 mph. Friday should remain warm but rain is forecast. However, the final day, Saturday the 23rd, looks sunny, cooler (55) and windier. Every day may not be perfect but the two opening days look optimal. For aircraft departing on Sunday, weather again looks quite accommodating with the high above 60 and winds out of the west-northwest at only 5 to 10 mph.